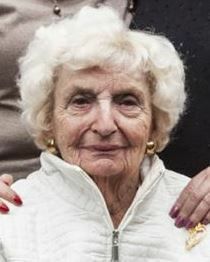 Our beloved mother and grandmother Jean Kahn passed away in Napa at 102. Active and on-the-go, even as she turned 100, she was constantly amazing people with her spryness, quick wit and her willingness to speak her mind. This past fall at a centenarian celebration in Napa she was asked, “What do you miss most about the good old days?” Her quick reply: “My youth.” That was our Jean, who still drove herself throughout the valley as recently as this year. Born in Alameda and raised in San Francisco, she later graduated from UC Berkeley and then worked as a medical secretary. In 1942, she married Max Kahn while he was a sergeant in the Army. The couple had two daughters — Carole Murio and Janice Hanson — who preceded their mother in death. After her husband’s death in 1977, Jean moved to Napa where she lived the past 41 years. She immersed herself in a variety of charities and organizations, including the Napa Bonsai Club, Lions and Lioness Club, Toastmasters, American Diabetes Association and for six years presented for the Napa Valley Museum’s Wappo Trunk Program with John Holt. Jean was passionate about her family and her artwork. She made and sold clay faces, miniature scenes and wine charms. She also started a business with her daughters — making and selling jewelry. She was also an outstanding and thoughtful writer, including this piece that ran in The Napa Valley Register: https://bit.ly/2KKqId2 Jean is survived by her four grandsons Christopher Manifold (Karyn Manifold), of Pearland, Tex., Brett Murio (Cathy Murio), of Fremont, Brandon Murio (Jane Pangilinan), of Brisbane, and Gregory Manifold (Bridget Manifold), of Kensington, Maryland. In addition to nine great grandchildren, she is also survived by her son-in-law Robert Murio of Napa. The family is planning a private service at Home of Peace in Colma, Calif., and a Celebration of Life with date to follow. For details, email gregmanifold@gmail.com. Donations may be made in memory of Jean to St. Jude’s Children’s Research Hospital.